The Mac Martin Foundation awarded several donations in 2018 to area organizations, including the Fairfield Park District, Fairfield Memorial Hospital Foundation, Wayne County CEO Program, WADI, Junior Achievement of Wayne County, and the FCHS Guidance Department. The foundation was established by Doug Wilson in honor of his grandfather, McDowell Martin. The West Salem Development Association is publishing a cookbook this spring and is seeking recipes. People can submit a recipe in various categories in a variety of locations in West Salem or via email to westsalemda@gmail.com. Submissions must be made by tomorrow, and the cookbooks are expected to be ready for Mother’s Day. The Fairfield Weight Watchers meeting for tonight has been cancelled, but other events in the area will continue as scheduled. The temperature is expected to rise as the day wears on, and the high tomorrow is forecast to be in the mid-40s. By Monday, the high could be in the mid-60s, though preliminary forecasts are calling for rain to begin the week. 34-year-old Fairfield resident Tracey L. Glad was arrested yesterday afternoon on charges of criminal damage to property and criminal trespass to a residence. Glad was transported to the Wayne County Jail and held, pending the posting of $170 bond. Illinois State Police have arrested a man after a trooper was struck and killed by a vehicle during a snowstorm in suburban Chicago. Kenosha, Wisconsin, resident Scott A. Larsen was arrested for striking Trooper Christopher Lambert. The Cook County State’s Attorney’s Office approved reckless homicide charges against Larson. Park District officials say there will not be a goose hunt, as authorized by the Fairfield City Council. Park Board President Jay Fyie says the recent cold weather has caused the lake at the course to freeze over, and the geese have left the course. Fyie says the Park District will now seek other remedies to deal with the geese problem. The Fairfield Public School District 112 Board of Education met Monday evening with a light agenda on hand. Board members unanimously approved a social media policy that would expand to board members, in addition to certified and non-certified staff. In other business, the district approved Andrew Gifford as a volunteer 5th/6th grade boys basketball coach. The unemployment rate in Illinois rose from 4.1 to 4.4 percent in December, and most counties in southern Illinois also saw a spike in their numbers. Wayne County rose to 6 percent from 5.5, one of the higher marks in the immediate area. Edwards County experienced the biggest jump, going from 4.4 percent in November to 5.6 percent last month. Fairfield Memorial Hospital has announced Morgan McCoy as its January Employee of the Month. McCoy, the Diagnostic Imaging Secretary, has been with the hospital since July of 2017. Officials say that, though patients don’t always see her work, she is behind the scenes helping to ensure their appointments take place as quickly and easily as possible. 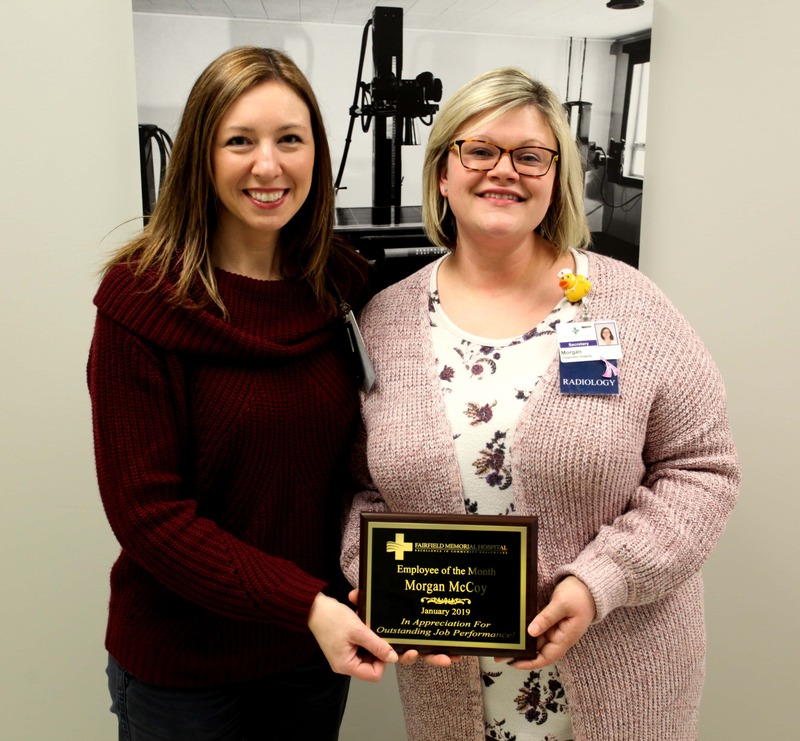 Kyla Borcherding (left), Diagnostic Imaging Director, presenting the plaque to Morgan McCoy. The Illinois House adopted rules earlier this week which give Speaker Mike Madigan the ability to control which bills come up for discussion and debate, and which ones do not. State Representative Darren Bailey said the Republican side of the aisle only wants rules that are fair and reasonable rules that both parties can get behind. The president of the University of Illinois is proposing a tuition freeze for in-state students for a fifth consecutive year. The base annual tuition for Illinois freshmen would remain at $12,036 in Urbana-Champaign, $10,584 in Chicago, and $9,405 in Springfield. Trustees will vote tomorrow on the proposed rates and fees, which will remain constant for four years. River stages as of this morning: Little Wabash, east of Fairfield stands at 24.99 feet, above the 17 ft. flood stage. Meanwhile, the Skillet Fork at Wayne City has a reading of 5.67 feet (flood stage is 15 ft.). The Little Wabash below Clay City is at 10.37 feet (flood stage is 18 ft.).